Looking for a keyboard tray, monitor arm combo? 1. 8138 is 27.5" wide, has a mouse pad and a wrist rest. Shipping Dimension: 31" x 19" x 8". 2. 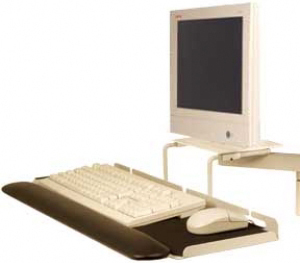 Independent rotation & pivot between monitor and keyboard tray. 3. Requires 8131 Keyboard Adapter (included with 9140 data entry arm). 4. Combination mouse tray adapts for left or right-handed users. 5. You can retrofit it into any arm, however it requires the 8131-52-10- back adapter.